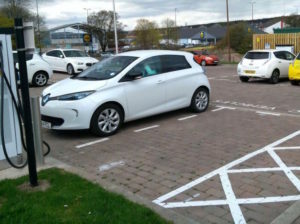 Dundee City Council is seeing successful results from the installation of eVolt UK rapid charging units intended to promote electric taxi use. The four Raption 50kW rapid chargers and three 22kW eVolve chargers have gone live at the new hub at Aimer Square. The rapid chargers are capable of charging two vehicles simultaneously at full power in approximately 30 minutes. Two more rapid chargers will be installed at Aimer Square later this year, followed by the installation of two further hubs – at Queen Street car park and Prince’s Street – under the Office for Low Emission Vehicles’ (OLEV) Go Ultra Low programme.